More retro sounds from Norwegian 70s obsessives Arabs In Aspic. Things sound promising as soon as crunching Hammond organ lets rip over lashings of Black Sabbath-esque dirt at the start of opener You Can Prove Them Wrong, and thankfully the quality doesn’t slip. 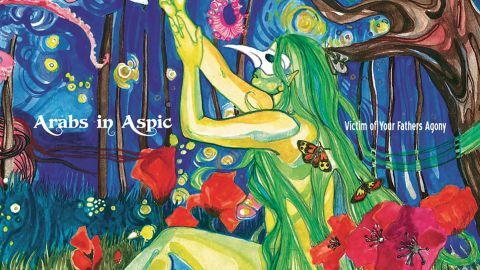 Victim Of Your Father’s Agony is the sixth record from Norway’s Arabs In Aspic and it’s a whirlwind of 70s classic rock meets prog and psych, with organ, soaring harmonies and guitar virtuosity bubbling furiously to the surface. One is a rollicking, rabble-rousing journey through galloping riffs and hazy melodies, while the eight-minute long God Requires Insanity nods to Yes in its more serene moments. The oddball TV 3, meanwhile, is almost Zappa reincarnate. Make no bones about it: this is an unashamedly old school album. a bad thing. The stonking title track closes the album, and once it ends you’re left a little drained. Not that the album is exhausting, but – despite the band’s more modest Sabbath roots – there are scores of nuances to discover and assimilate. Heavy and soft, daring and straightforward, melodic and brash, it’s a damn good listen.